The usual drama attached to any hustings in India apart, the 2017 Punjab polls for the 117 State Assembly seats and by-election to Amritsar Parliamentary constituency, will go down as offering some of the extended ‘ghar vapsi’ or coming ‘home’ scenes writes Avinash Singh. Every third candidate contesting in Punjab has shifted loyalties in recent months or weeks. Politicians were still jumping the fence at the time of going to the press, shunning parties they owed allegiance to. In some cases it was also a merry-go-round – switching parties twice and making amends again to come back home – ‘ghar vapsi’. Darbari Lal of Congress and Upkar Singh Sandhu are perfect examples. Those who did it early had the excuse of ‘ideological differences’, others did it in name of ‘serving the people’, and ‘doing something for the State’ and ‘saving the State from the drug lords’ or because ‘Punjab and Punjabiat was close to their heart’. Every single party – Congress, Akali-BJP combine and Aam Aadmi Party – saw exodus and embracing the ‘Dal Badlus’. Pledges plenty, Arvind Kejriwal’s outfit was no exception. Among those floating for some time to be fished had a definite agenda and wanted surety of a role they desired, some were begging to be picked up after initial rounds of bargaining failed. Some even formed new regional parties, others launched ‘fronts’ only to see them biting the dust. And still others became representatives of political parties having no base in Punjab, creating a social service unit, extending support to a party they wanted to join but could not because of the opposition from within. What was in common? They all were in search a seat or wanted their identity to be intact. Rebels too are there in the fray, as always, in good number. ‘Ghar vapsies’ too were happening till the eleventh hour. The fate of many hung in balance with January 18 being the last date for filing nominations. On the eve of the poll, not one party could stand up and assert that rebellion among the ranks and internecine war was no a non-issue with them as the state goes to poll on February 4. Social media going hi-tech, print media selling packages, television channels openly flaunting their leanings, poll strategists being super active and software companies offering digital solutions are some of the interesting features that may be true of elections to all the five States where Assembly polls are due in February and March. But this border State stands apart for a different reason – for the presence of a large bunch of expatriates trying to influence the final outcome. A sizable chunk of NRIs have landed, or are in the process of doing so, to campaign for AAP. Concerned about the development, Amarinder Singh and Badals too have summoned their offshore supporters – all bringing in financial aid too in the cash-strapped post demonetisation scenario. 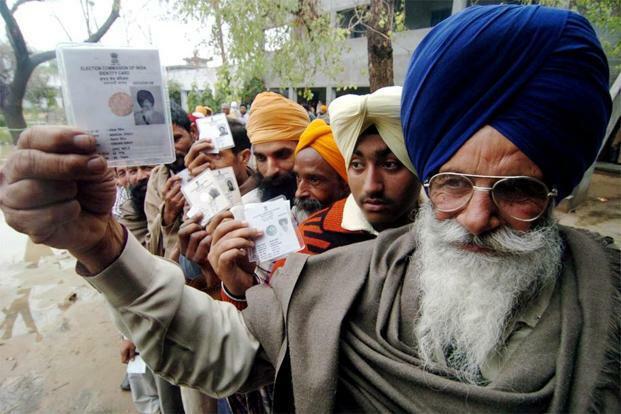 They may have a minuscule number of votes in Punjab, but non-resident Indians from outside India are coming home to support the political party of their choice. A second bunch of AAP volunteers from Canada are taking a chartered flight from Toronto that is to land in New Delhi in the wee hours of January 19. Jaskirat Mann, the country convener for AAP in Canada, who has been campaigning in the Malwa belt for the last three months, is now accompanied by a team of evangelical NRIs, who registered for the party’s ‘Chalo Punjab’ campaign. “I tell people how my husband and I were able to set up a transport business in Canada because of the processes there, and how AAP will replicate those here and ensure good governance,” says the articulate former captain of her BEd college at Lopon near Moga, who migrated to Canada in 2002. They also “convert” the dedicated cadre of other Clash of Turncoats The usual drama attached to any hustings in India apart, the 2017 Punjab polls for the 117 State Assembly seats and by-election to Amritsar Parliamentary constituency, will go down as offering some of the extended ‘ghar vapsi’ or coming ‘home’ scenes writes Avinash Singh 20 Policypulse parties. Mikki Shah is the man doing all the campaign in the US alongside others. Intriguingly, the floor crossing and ‘the grass being greener on the other side attitude’, having taken the spotlight, the core issues of an economy that is in a dep debt of Rs 210,000 cr, unemployment, static agriculture production, no diversification of crops, rural health and education being ignored, big time exodus of industry before and after demonetisation, have been forgotten by the political parties and masses alike. Local issues will take precedence over the issue of State or National importance when the results are declared on March 11 – over 40 days after the fate being sealed in the ballot machines. One issue that the Congress and Akalis seemed to be harping on more was the issue of sharing of water with Haryana and pledging that the SYL canal would never be completed. Both were bending backwards to highlight that the AAP chief Arvind Kejriwal, was a candidate for the Chief Minister’s position and that he hailed from Haryana. The propaganda made Delhi CM reiterate that he was not. Against the suspense of cricketer-turnedpolitician Navjot Singh Sidhu, as to which party he will join and what seat he will contest, the lone but high profile Parliamentary seat of Amritsar rendered vacant with Capt. Amarinder Singh resigning in October, lost its importance. The seat held by Navjot Sidhu three times, as a BJP nominee, where Amarinder had humbled the incumbent Finance Minister in Modi Government at the Centre Arun Jaitley, is now been being contested by three reluctant nominees. In the fray are Rajinder Mohan Singh Chinna of BJP, Upkar Singh Sandhu of AAP and Congress lightweight Gurjeet Singh Aujla. Chinna’s claim to fame is that he has been Honorary Secretary of over 125-old Khalsa College at Amritsar, till he got appointed himself as ProChancellor of recently established Khalsa University, courtesy his closeness to Satyajit Singh Majitha, President of the Management Committee of the College and Governing Council of the University. The latter happens to be the father of Bikramjit Singh Majitha, a Minister in Punjab Cabinet and brother-in-law of Deputy Chief Minister Sukhbir Badal. Upkar Singh Sandhu, a former Punjab Energy Development Agency (PEDA) chairman, left Akali Dal to join AAP and then moved to Congress to ditch to rejoin AAP – all in a period of seven months. He was desirous of being a candidate in the State Assembly seat that he had lost last time. He was the president Amritsar Urban District of Akali Dal. Aujla, the Congress nominee, has been a Counsellor and party president of the district rural unit. His dream too was an Assembly ticket from Raja Sansi or Amritsar West. Sidhu finally joined the Congress on Sunday, January 15, with formalities happening the following day. From saying that joining Congress was his ‘worst mistake’, to the rumour that he has joined to finally edge out Capt. 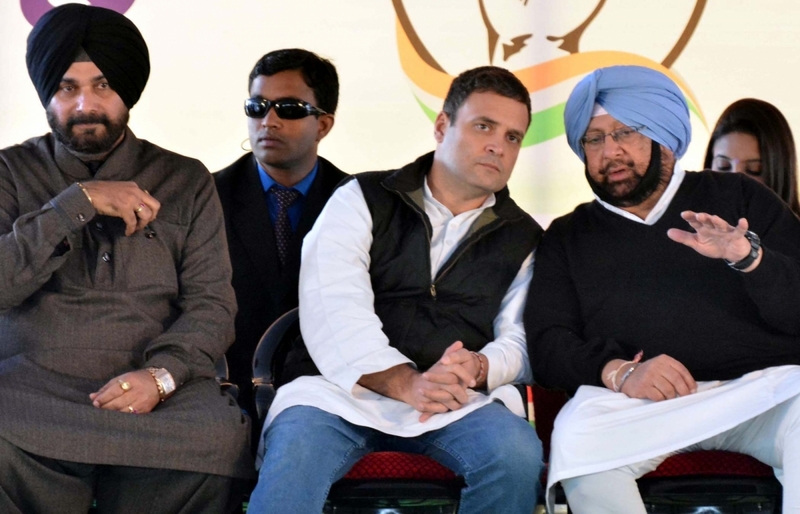 Amarinder Singh, who because of his ‘arrogant and haughty’ attitude has never been liked by Congress vice-President Rahul Gandhi. Amarinder’s desire for filing of his nomination from Lambi constituency of Prakash Singh Badal, in addition to Patiala, has added fuel to another spark that the Baba (Rahul) has asked Amarinder to contest elections against Badal only ‘letting Patiala go’ (from where his wife Parneet Kaur, who is the sitting MLA) to fix him. Chief Minister Prakash Singh Badal was quoted as saying in a recent interview. “In Punjab, we are seeing opponents of Akali Dal trying to settle their intra-party discontent by pushing some of their ‘star contenders’ into Akali strongholds. Earlier, we saw how Arvind Kejriwal smartly manoeuvred Bhagwant Mann and other major AAP leaders into traditional Akali seats. Mann is supposed to contesting Jalalabad, constituency of Sukhbir Badal. Rahul seems to have followed that pattern with Captain. Rahul has done to Captain what the latter has been doing it his junior rivals in then party in the past. Amarinder, however, calls all these merely idle conjectures. Rumbling within parties, however, have been surfacing too often. Congress alone has picked up many leaders who switched over to the party from Akali Dal. A recent list of 23 candidates cleared by Congress High Command had Rajwinder Kaur Baghikey, a sitting MLA from Akali Dal, being given a ticket from Nihal Singhwala, while former Akali Lok Sabha MP Mohinder Singh Kay Pee has Sidhu’s joining the Congress on Sunday, January 15, formalities were gone through only the following day, has given a handle Akalis and BJP. From saying that joining Congress was his ‘worst mistake’, to the rumour that he has joined to finally edge out Capt. 21 16-31 January 2017 been fielded from Adampur. Interestingly, Deepinder Singh Dhillon, who had lost against Parneet Kaur in the 2014 Lok Sabha polls as a Akali nominee, has been given ticket from Dera Bassi. Akali leader Kamaljit Singh Karwal, who switched allegiance to Congress, will fight one of the Ludhiana constituencies, while Harminder Singh Jassi, a relation of controversial godman Dera Sacha Sauda, Gurmeet Ram Rahim Singh, has been fielded from the Maur Mandi. Devinder Gubaya, son of Akali sitting MP from Firozpur, Sher Singh Gubaya, has been given a ticket from Fazilka. Former CPI leader Nathu Ram, is contesting Balluana as Congress candidate. Former Akali Chief Minister of Punjab Surjit Singh Barnala and Governor Tamil Nadu, who died on the weekend, has his grandson contesting the Dhuri seat Congress ticket. Although every party has been talking about strictly following the rule that one family would have only one candidate for the Assembly elections, kin and siblings of at least 30 current and late politicians have been accommodated in one list or the other. Karamjit Kaur Chaudhary, wife of Lok Sabha MP from Jalandhar Santokh Singh Chaudhary has been fielded from by Congress from Phillaur. Rajinder Singh, son of former Minister Lal Singh, has been given a ticket from Samana constituency. The candidature for Sanaur seat, where Lal Singh is a sitting MLA, has not been announced. From among the crossover candidates Pragat Singh, former India hockey captain and Olympian, was the one awaiting and announcement. Pargat is an aspirant for Jalandhar Cantonment constituency. He was the one who alongside Navjot Sidhu and Bains brothers from Ludhiana had launched the Awaz-e-Punjab front. Bains brothers – Simarjit and Balwinder Singh – have already moved to AAP, while Sucha Singh Chottepur, sacked by AAP in August, who was to join Sidhu’s front had cried off to float his own party with support of Yoginder Yadav and Dr Dharamvir Gandhi, two former AAP functionaries. AAP has also lost one of the most prominent personalities of the State, Dr Daljit Singh, the eye surgeon, to Congress. Former Indian women’s hockey captain Rajbir Kaur, has probably been the biggest loser for having joined AAP. Her husband, hockey ace Gumail Singh, was purged of his position in Punjab police within one week of Rajbir joining the party. If AAP does not win in Punjab, “preferring crossover candidates and ignoring workers who have toiled for the party in last couple of years would be reason,” quips Rajbir. Sarabjit Singh Ukhla, who shifted back from Canada lock stock and barrel four years back and has really worked hard in Patiala, Nabha and Sangrur constituency for AAP agrees with Rajbir. As things stand, on paper Congress has an edge whereas AAP has potential to spring a surprise, Akali Dal has been banking on the rural votes on the strength of the tonnes of ‘moolah’ (money) that has been pumped in through the panchayats over last one year and misusing the official machinery in keeping a tab on Government servants, handing them veiled threats. Development is the other plank on which Akalis will be contesting. While AAP’s rural network may see them through in Malwa region in a big way, Congress has strongholds in Doaba and pockets in Malwa, while Majha still has Akali-BJP vote banks. Of late, BJP has been at a loss for evening picking their candidates. They have 12 MLAs in the current dispensation, Akalis have 56, Congress 46 and three others. The election Commission meanwhile has showed concern over use of drugs during the run up and use of ill-gotten money despite the cash crunch. All this while there have been incidents of stone-pelting and hurling of objects at candidates during campaigning. The Election Commission had recently directed the state police chief to take steps to ensure that such instances are stopped immediately. Immediately after, a youth hurled a shoe in the Lambi constituency at Chief Minister Parkash Singh Badal.